The creators of several Virtual Private Networks (VPNs) have criticized Apple's decision to remove their products from its App Store in China. VPNs allow users to mask their identity online by funneling web browsing and other internet activity through a third party's computer. As a result, users can hide their IP addresses and access online material that has been censored or blocked by their internet service provider. Which VPNs have been affected? 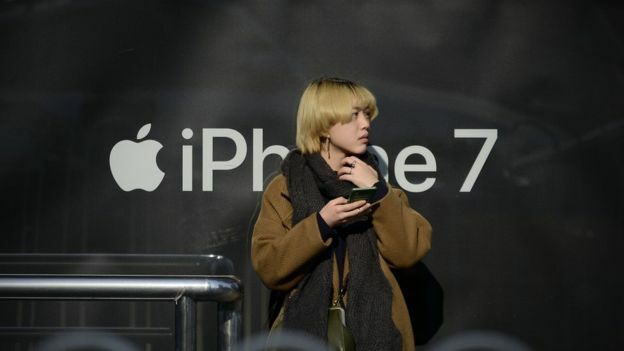 A company that analyzes mobile app sales, www.aso100.com, has told the BBC that more than 60 VPNs were no longer available in Apple's China mainland App Store. Golden Frog, the company that distributes VyprVPN was critical of the decision, saying it would file an appeal with Apple. "If Apple views accessibility as a human right, we would hope Apple will likewise recognize internet access as a human right (the UN has even ruled it as such) and would choose human rights over profits," said Golden Frog's president Sunday Yokubaitis in a blog post. ExpressVPN said it was "dismayed" that the tech giant had "sided with censorship." The apps are still available in Apple's App Stores outside China. Who uses VPNs in China and why? China has for many years censored content it sees as politically sensitive, using an increasingly sophisticated set of filters that critics have called the "great firewall." In its most recent rankings, the advocacy group Freedom House dubbed China "the year's worst abuser of internet freedom." VPNs allow users to skirt around these filters and gain access to websites and services that are restricted or banned. There is no outright ban on VPNs, and in fact many major corporations use them legitimately under the current laws. The latest push to tighten access has targeted VPNs that are mostly used by individuals rather than companies. In January, China's Ministry of Industry and Information Technology announced that all developers offering VPNs must obtain a license from the government. 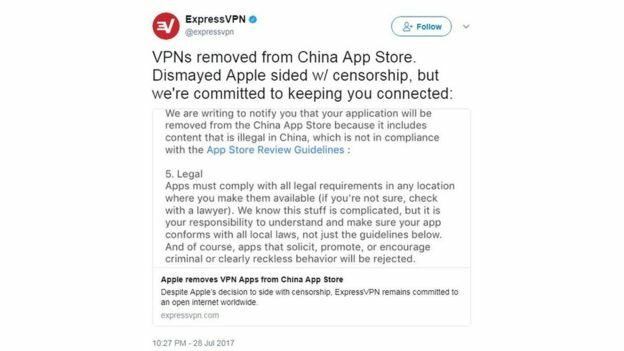 And Apple said it was required to remove some VPN apps from its store because they didn't comply with those regulations. But it is fair to say that Apple has many reasons to be wary of incurring Beijing's wrath. The tech giant makes much of its hardware in China, and it has become a major market for its products too. And with low cost local competitors cutting into the iPhone's market share, Apple's profits are more likely to depend on apps and services, some of which could run into China's censorship regime. 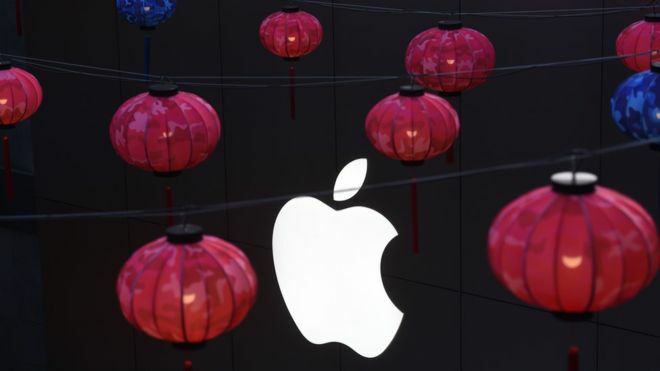 Earlier this month Apple also established its first data centre in China, in conjunction with a local company Guizhou-Cloud Big Data Industry. Although Apple said it would retain the encryption keys and would not compromise users' privacy, some experts have suggested that housing data in China could create pressure for Apple to hand over data in future disputes. Recently, attachments such as voice messages and images stopped working on the messaging app WhatsApp. The Chinese government has not confirmed that this is part of a censorship push, but WhatsApp has not made any suggestion that it was merely a technical problem. Beijing blocks social media sites and apps, including Facebook, Instagram and Twitter. Search engines like Google are blocked, and access to many foreign media outlets, including the BBC, is restricted. Recently, China blocked social media posts and even private messages and group chats about the death of Chinese dissident Liu Xiaobo. The government is expected to tighten restrictions ahead of the next communist party congress, where President Xi Jinping is tipped to retain the top job.